In a previous blog on World Health Day, I described the main source of health care in PWNA’s service area as Indian Health Service (I.H.S. ), which serves Native male and female residents of tribal areas, but the delivery of preventative care stems largely from tribally operated wellness programs. Health literacy and health education activities are also critical to disease prevention. Lower education levels are tied directly to lower health literacy, so health events and awareness activities are important to populations that are challenged by educational disparities. PWNA supports hundreds of reservation-based program partners in getting health information to community members, and in recognition of Men’s Health Month, some of them are hosting Community Events to increase awareness of preventative care among the male members in their tribal communities. Throughout the month of June, one of our partners through the Navajo Nation is conducting a health fair and screenings in eight different chapters, to ensure information on preventative care and health promotion is available. Area health providers will conduct sessions on health awareness, prevention and education, specifically focusing on the theme of “Educating our Native Men and Their Families.” Some topics to be covered include high blood pressure, sexually transmitted diseases, and hygiene. Printed materials will be distributed and available as takeaways, but having health care providers available to address any questions that arise from attendees is equally if not more important. The Tribal Health Department, a PWNA partner from the Gila River Indian Community, is also promoting men’s health by raising awareness in five of their communities. Some of their education will also include summer-related illnesses caused by ticks and mosquitoes. Suicide rates are nearly 50 percent higher for AI/AN people compared to non-Hispanic whites, and more frequent among AI/AN males and persons younger than age 25. Pine Ridge has the lowest life expectancy (66.8 years) in the U.S., according to JAMA (2017). Over 23% of Native men 18 years and older smoke cigarettes, per the CDC (2012-2014). 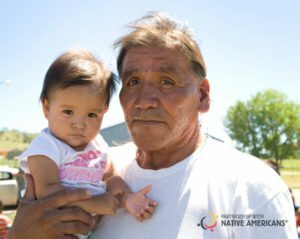 Our tribal community partners are working year-round to instill prevention and healthy lifestyles into the hearts and minds of Native Americans. PWNA is proud to support their collective efforts to recognize June as Men’s Health Month, and to give a shout out to father’s everywhere this Father’s Day. This entry was posted in Humanitarian and tagged Father's Day, health disparities, Health Education, Health Professional, Men's Health Month, Native American, prevention. Bookmark the permalink. Trackbacks are closed, but you can post a comment.